This morning I did not go to Amphawa, a town 60 km outside of Bangkok that’s known for its floating market. I did not catch a ride with Becca, Franck, Ananda, and Becca’s mom in their new car. I did not spend the first of two nights in a home share with a local family. I did not eat dinner handed up to me by a woman in a boat using a long pole. I did none of these things because I’m cheap. Oh, don’t get me wrong–I’d have paid to go to Amphawa. I’m not cheap about experiencing new things (I’ve never been to a floating market and I so want to eat food from a lady on a long boat). I’m talking about me being cheap two weeks ago in Penang, Malaysia. You see, in Penang, the local Thai consulate will issue you a 30-day tourist visa so long as you pay about $40 or so. If you do not, however, get a visa from the consulate and decide to get a visa at an overland Thai border station, the longest visa you can get is 15 days. Stay with me. This is going to be tough, but we have to do a little math. I reentered Thailand on April 2. Counting April 2 as “Day 1” of my 15 day visa, I am permitted to stay in Thailand until April 16. Becca and Franck were willing to let me ride with them to and from Amphawa on their two day excursion. They would return on Bangkok on the afternoon of April 16. The problem is that’s not enough time for me to go overland to the Cambodian border on the 16th. I would have to overstay my visa by one day and leave Thailand on the 17th. Bad bad bad. Back in Penang, I figured another 15 days in Thailand would be enough. Why pay the $40 for 15 extra days I wouldn’t use anyway? Well, turns out I could’ve used one extra day. If I could go back and do it over again, I’d have paid the $40. Ah, the dangers of traveling with only a loose itinerary. The blessing and the curse. Instead of joining Becca and Franck, I went over to their place for an early breakfast. I was out the door by 7 a.m. and at their place before 8. They fed me, humored me while they packed, then jetted off on their holiday, telling me I could hang out at their place as long as I wanted if I locked up when I left. I took full advantage of this and promptly fell asleep on their couch for a few hours. Then I spent the afternoon alternating between sleep and reading every article I hadn’t read in the past month on the internet. By the time I left, it was late afternoon. I went to MBK food court for a quick meal (noodle soup with beef, $1.25) then headed home. That’s when I remembered my old stand-by: snacks. I popped down to the 7-11 and created a little tasting menu. I grabbed three items that I thought deserved a chance. Here they are in no particular order. First up, something called Yoghurt with Nata de Coco. From the label, I guessed it had something to do with young coconut. There were little cubes in the picture, so I was hopeful that it’d have little jelly things. I was right. This yoghurt is delicious. The natural sourness of the yoghurt balances nicely with the subtle sweetness of young coconut. You also have the added benefit of a flavor burst and texture change every time you come across the jelly cubes. The cubes are firm, not flimsy like grass jelly. I will pretend it’s not because of a thousand preservatives. I’d call this snack a good dessert. 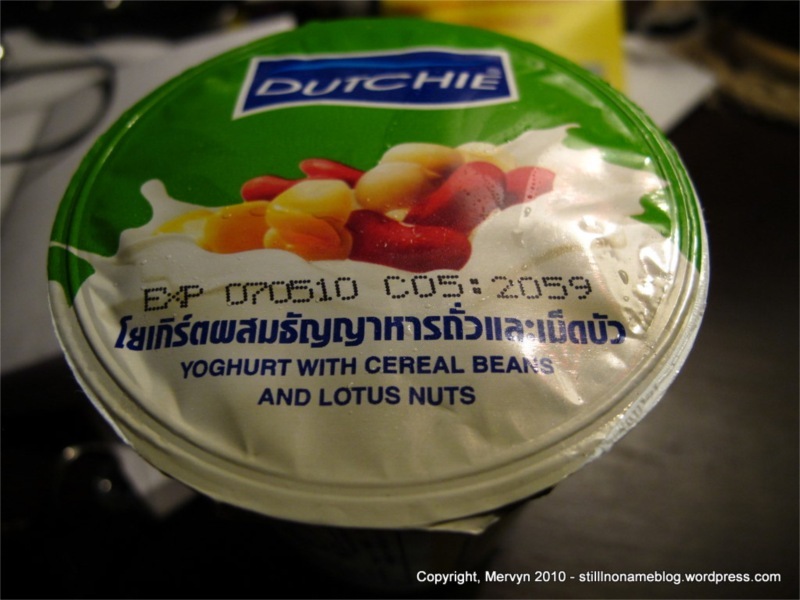 Next up is another yoghurt, this time with Cereal Beans and Lotus Nuts. I felt that the description was incomplete, since the side label had a picture of an ear of corn. This yoghurt was not that good. 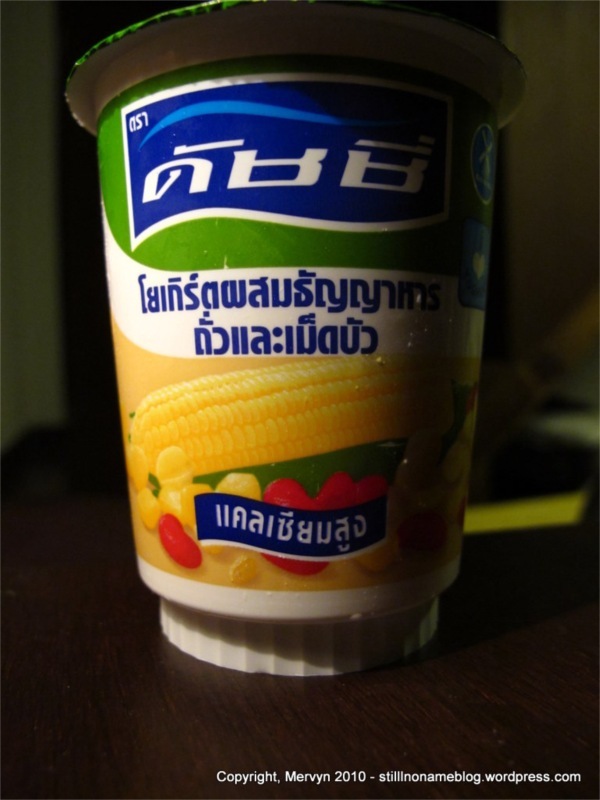 I really liked the corn flavor and the corn kernels. They did the same thing as the young coconut did in the Nata de Coco, balancing the sour with some sweet. I did not, however, like the lotus nuts. They were more firm than the jelly cubes in the Nata de Coco flavor, but not crunchy. That meant they came off as either undercooked (too hard) or soggy (too soft). I wish it had been either crunchy or soft. Sadly, this would not have rescued the yoghurt. The lotus nut flavor did nothing for me. In fact, I think they made it too bitter. You’ll notice that I didn’t really talk about cereal beans. That’s because I have no idea what they are and didn’t’ notice them as I ate. Taster party foul, I know. Too bad for you I’m not a chef. Finally, we have something from Bento. 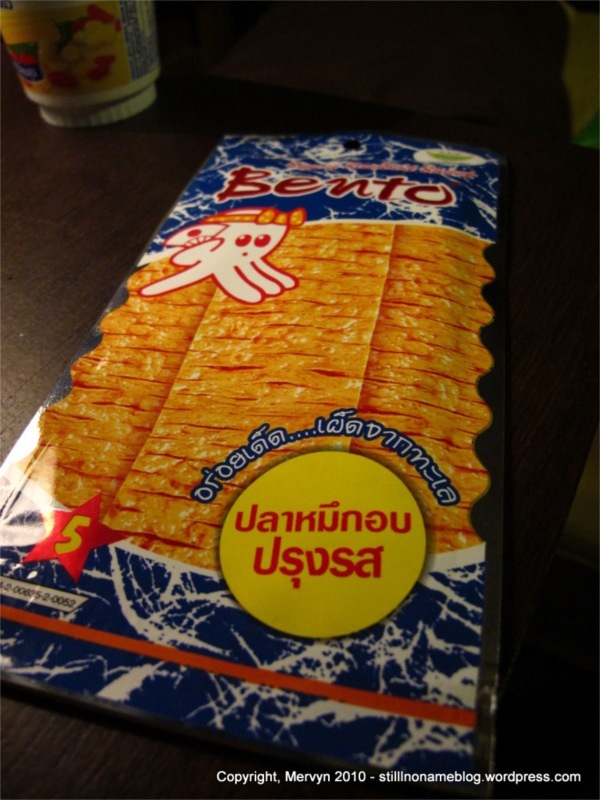 At the top it said “Squid Seafood Snack.” From rubbing the packaging between my fingers, I guessed it was something like beef jerky, but with no beef and more ocean. When I ripped open the foil and plastic container, I was not disappointed. The package said “squid” but I think it was being optimistic. This was much more like “seafood” which is a flavor the same way Miley Cyrus is an actor—just because you say it is one doesn’t it make so. The jerky is gummy and doesn’t rip so much as ooze into two pieces, notwithstanding the deceiving score marks. Not bad tasting, but not good either. It just is. It’s not filling. It’s not particularly tasty. Perhaps if you ate it with rice, it’d be better. Of course, that could be said of about nearly every food, so that’s not saying much (See: spaghetti, which I grew up enjoying with the Asian staple). So there you have it. 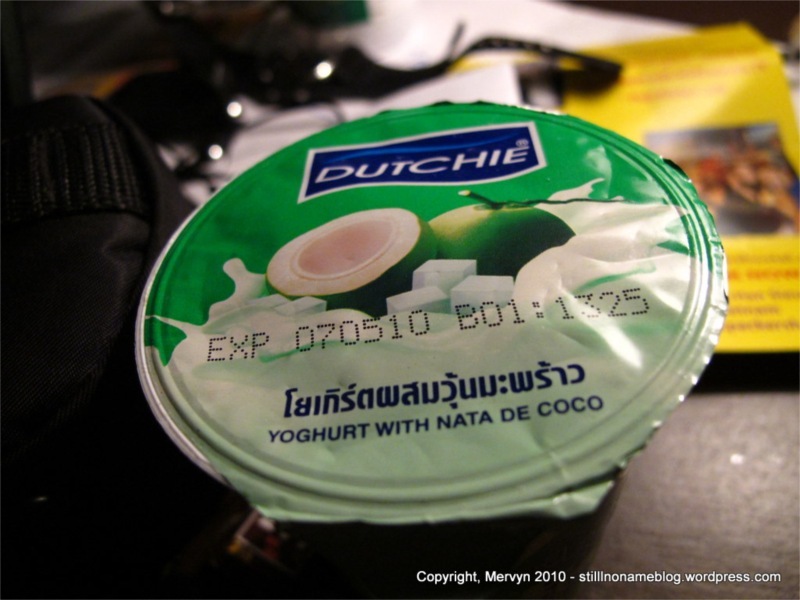 One hit, one miss, and one “eh.” Next time you’re in Thailand, you’ll know to avoid the Yoghurt with Cereal Bean and Lotus Nut, grab the Nata de Coco instead, and bring some rice when you buy Squid Seafood Snack. Now, would you prefer I send the bill to your work or home address?